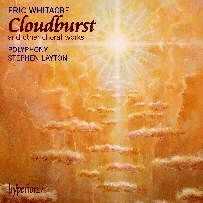 Back in February this blog was one of the first to highlight Cloudburst, the exceptional new CD of Eric Whitacre's choral music on Hyperion. So it's good to see the Grammy Awards Recording Academy agreeing with me and making it one of their 2006 Grammy Nominations - check this link for the full list. Now see what the Grammy winners actually receive at Her Master's Grammy.